Move over, Robert Pattinson. A new supernatural heartthrob is set to hit the big screen. 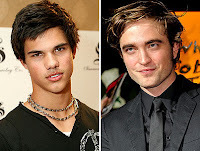 Pattinson, who starred as “Twilight’s” leading man, vampire Edward Cullen, skips town after just two scenes in the franchise’s sequel, “New Moon,” making way for Taylor Lautner’s werewolf, Jacob Black, to romance Kristen Stewart’s character, Bella.